The Quilted Windmill, formally VandeLune Fabrics, is a friendly, full service quilt shop in Pella, Iowa. We offer a delightful selection of top quality fabrics (including Civil War reproduction prints and cozy wools), along with books, patterns, sewing notions, and kits, to inspire your creativity and help you finish your projects. 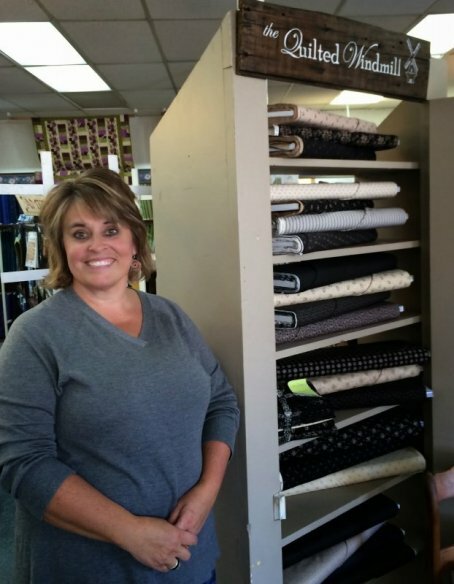 Owner, Kelly Van Vliet, has spent the past 14 years building a successful longarm quilting business, Quilts by Kelly. But when the opportunity arose to purchase the local quilt store, she jumped at the chance to merge her quilting specialty with a brick and mortar shop to bring our community a broader range of products and services. Located on Franklin St., our shop features a welcoming atmosphere where quilters can gather to improve their craft and enjoy the fellowship and support of other stitchers. We provide a full schedule of classes for quilters of all skill levels, as well as a weekly demo day (held each Saturday) for product and technique presentations. Additionally, quilters can save 30% on any product stashed in our antique wash tub on Wash Tub Wednesdays. Whether you need help selecting fabric or finishing a quilt, The Quilted Windmill has everything you need for a pleasant and successful quilting experience!